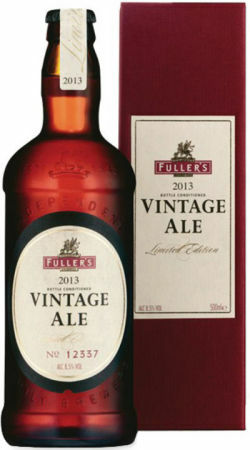 The 2013 Fuller’s Vintage, our 17th edition, is brewed with four of this year’s finest hop varieties: Goldings, Sovereign, Challenger and the trophy-winning Admiral. WIth a dry spring and wet summer, we have chosen a winter barley wich, when combined with our unique yeast, gives a rich and complex result. Bottle shared with Višnja 666 and Pilot Goran at a Mega Tasting, October 12th 2017. Amber to copper, small to a medium off-white head. Cookie dough, dried fruits, complex maltiness, some dark cherry, very light peat, figs, spices and light zest. Beautiful sweetness, great balance, light dryness form spicy flavours in the finish, slightly salty. Very rich and syrupy, medium to full body. Beautiful and aged so well. Panel "Nudna Anglia vs Nieciekawa Belgia" w Strefie Piwa. Piana szczątkowa, gruboziarnista. Aromat zaskakująco intensywny, suszone owoce, miód, biszkopty. W smaku już nie jest tak ekstrawagancko - wychodzą nuty bardziej herbaciane, cukierkowe. Goryczka nieco ściągająca, alkohol minimalnie wychodzi na finiszu, choć nie przeszkadza. Efekty utlenienia są wyczuwalne retronosowo i robią złudzenie niezłej pełni. Dużo ciekawiej pachnie niż smakuje. Flaske 500ml spandert av Rune. Delt med ham og Richard på førjulstreff i WCveien 15 Des 17. Aprikosfarget. Filmskum. Aroma av plommer & karamell. Smaken fersken & plommer. Balansert & passe søt. Bottle from my cellar. Smooth mild beginning. Fruity wood, deep malt, Quite dry, not too intense bitter. Nice fruity in the end, round and smooth. Nice. Brown color, off white head with short duration, some lacework. Aroma has notes of toasted malts, caramel, honey and dry fruits. Flavor is slightly bittery, toasty and earthy notes. Alcoholic presence. Bittery final, dry mouthfeel with light toasted malts on palate. 500ml. Foggy orange is dropping clearer. Caramel and hints of vanilla. Fruity hop and alefruit. Some earthiness and bit of acidity. Body is solid. (Bottle, #095868) Amber colour with frothy, beige head. Malty, slightly fruity nose with notes of dried apricots, orange, caramel, citrus peel, rye bread, raisins and raspberries. Malty, fruity taste with orange, mandarin, apricots, bread, raisins (sultanas), caramel, toffee, some strawberries and a balanced citric/earthy bitterness in the finish. More than medium body, with a certain sweetness. Really tasty, and exceptionally well balanced (as usual). Very nice.